Don't Jump to Conclusions - Lesson My Friend Taught! 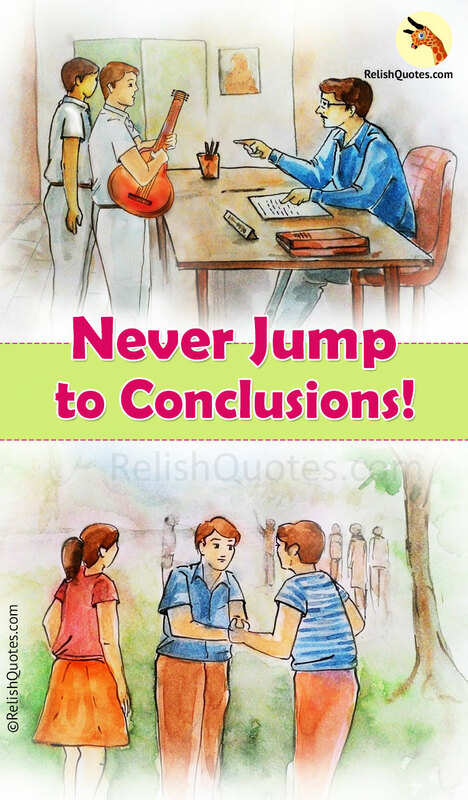 Never Jump to Conclusions – Lesson My Friend Taught! When the school attender came to my class, all the gloomy faces in the class seemed to light up. That’s one common thing that happens in all the schools. A note from the office of Head Master during a boring class is the best thing that can happen to kids. Especially when the note is about a trip or picnic, all the kids in the class will be very excited. Similarly, that day too when the boring Language class was going on, the attender entered the room with a note. All of us were eagerly waiting for the teacher to read the note. As expected, it was a note about the trip! All of us jumped in excitement. We were in grade 10 and this was our last year in school. The trip was organised on 21st of December to one of the most lovely places in South India, Waynad. Waynad that is surrounded by a chain of hills was situated in the state of Kerala. We were all excited about the trip and I could see people discussing about “What dresses to get? What dresses to not? If we could secretly carry a mobile phone? If we could carry walkman?” and so on. My best friend Aditya and I started discussing if we could carry our guitars to Waynad. Playing guitar amidst nature is the best combination! Both of us were guitar freaks and we thought we’ll talk to the head master about carrying guitar along with us. When we spoke to our class teacher, she directly disapproved the idea of taking guitar along. She said, “It is a school trip not a music tournament. You guys will have a chance to.play the guitar in the school assembly if you wish, but I don’t think the principal will allow you to carry guitar along”. We were disappointed. But my friend Aditya, he never gives up! I’ve literally never seen him giving up! He said, “Come on Pratham, let’s go meet the principal!”. I wasn’t ready for it. But before I could talk something, he had already dragged me to the principal office. The principal was busy speaking to some parents. We went to him and spoke about our plan. To.our luck, the principal consented. He told us not to play the guitar while traveling. We were very happy he let us carry the guitar. For Aditya, carrying guitar along had an other purpose too! His crush Deeksha! He had to impress her with his guitar playing skills. And playing it amidst nature is the most romantic way of expressing his love towards her. He wanted my help as his partner. I had to say a YES! After all, it was my best friend’s first love story..! Or may be just a crush story..! We practiced the tune and the song for 2 days. Both of us were very good at playing guitar and it didn’t really consume too much time for learning the right chords. We were all set to go! I took special permission from the principal again and told him to give us 10 minutes of time in Soojipaara falls (one of our visit places) to show our guitar wonders! Aditya was too busy in making sure Deeksha was coming to the trip. Unfortunately, one day before the trip, strings of Aditya’s guitar broke. He was way too disappointed with it. All our plans of playing guitar amidst nature and his plan of impressing Deeksha would go down the drain. I had to help him out some way! I told him I’d get my brother’s guitar for him. He didn’t consent. He wanted his guitar! And I could understand his situation! Guitar freaks I tell you.. to us, our guitars are like our wands in Harry Potter! We feel we build some connection with our guitar! It was raining. I had to make the plan work out. I knew what I had to do. I had repair the guitar. But for that, I had to go to city. That would take 2 hours. Aditya couldn’t go as he had to attend his close cousin’s wedding party. He relied on me for getting his guitar repaired. I called up my mom, told her I’d be late, took some cash from Aditya and left in the evening 5PM to city. As it was raining, it took me 2 and half hours to reach the guitar repairing guy in traffic. The guy fixed it in an hour and I left that place at 8:30 PM. It hadn’t stopped raining! I took a bus again and returned home with his guitar. It was 11PM when I came back home. I was shivering due to cold. I called Aditya and told his guitar was fixed and he could come to collect it. He lived only 10 minutes away. But then, he wasn’t ready to come. He was too sleepy and all he blabbered was, “Hey Pratham. I’m too sleepy now, just get the guitar directly tomorrow morning when we are leaving to Waynad..” and he hung up the call. I had to pack my bags too. Soon I ate my dinner and went to bed. The next morning I had to carry my guitar, Aditya’s guitar and my bag. He had left before than me to the school as his dad usually drops him in his car. I took a bus till school carrying 3 heavy things. Not to mention I had to be extra careful with 2 guitars. I finally reached school. I could see many people who were very excited about the trip. I saw Aditya who was trying hard to scratch a conversation with Deeksha. I thought, “This guy will never give up on anything! Be it his girl or be it his dreams!”. I smiled and didn’t bother to disturb Aditya. I carried the guitar to my bus. I reserved a seat for Aditya and was waiting for him to come. Every other classmate of mine entered the bus except for Aditya. I asked my classmates about it. They didn’t know where he was. I was worried as the bus driver was already all set to go and my best friend hasn’t entered the bus. I ran to my class teacher and told him about Aditya. What happened next took me by shock. My teacher told, “Don’t worry, your friend is coming in the other bus with “A” section people. He said he wanted to switch buses as his close friends belong to different section.. you can take your seat. He’s safe and he’s boarded another bus”. I was surprised! Not a pleasant surprise at all. How could he abandon me? He could have at least chose to tell me that he would be traveling in the other bus. May be both of us could go to the other bus. I knew why he went to “A” section bus. For Deeksha of course! But why would it be a pain if I went too? How could he not tell me? Besides, I had his guitar too! I felt abandoned. Anyway, I took my seat and started to talk with other classmates. We danced for a while and by 2PM, we reached the destination. Getting down from a crowded bus with 3 heavy baggages was again a pain to me. As soon as I got down, I was happy to see Aditya waiting for me. I felt like an old friend who’s come to re unite! Yeah yeah.. I know that was filmy! Anyway I just walked to him and before I could speak to him, he took his guitar bag from me and told, “Guess what! I got a room in the hotel where “A” section are going to stay! I’m very excited I’m in the same hotel too. Requested class teacher for it. Bye then, I’ll go my room. Bye bro!”. Now, this was definitely uncalled for. I felt terrible! The last day, I had travelled for 4 hours in a bus in the rain trying to repair his guitar, carried it all the way till here, and he didn’t even bother to ask if I wish to join him in his hotel room?” I was seriously offended. I was never against him and always supported his Crush story! How difficult was it to include me! I was too sad and somehow managed to cheer up with other classmates. We visited a couple of places before we reached our main destination – Soojipaara falls. The travel across the roads of Waynad was breathtaking! The tea plantations looked like a green blanket that’s covering up the red land. The scenery was wonderful. The birds chirping, the rustling of leaves, the fresh wind, the tea plantations, the grapes groves, the home-made chocolates…It was all beautiful! I was too happy about the trip and missed Aditya. I wondered if he even was thinking about me! We got down in one of our visit places and I saw Aditya. He was standing there talking about something with Deeksha. I really couldn’t hold back this time. I started walking towards him.. and as I went, I saw them going away from me. I felt utterly stupid! There I was trying to talk to my friend who’s running away from me. I thought I was being too sweet to a person who’s beng so mean! I cursed him so much and I went back to other classmates. When other classmates asked me about him, I showed all the frustration I had. I said, “To he’ll with Aditya! He’s having merry time with his crush and doesn’t want to be disturbed by his good old best friend! To hell with him. Don’t even ask about him now! He’s such a mean chap!”. After I spoke I realized I was too rude. I didn’t feel sorry anyway! I cursed him all the way! I thought he didn’t deserve my friendship! I’ll never be friends with him again! He’s taken me for granted! Ne er e er will I talk to him properly again! Our friendship ends there! Next came the Soojipaara falls, I thought Aditya had a last chance. I thought I’ll tell him, “This is the last time I’m going to play guitar with you!” when he approached me for playing the guitar. The teacher announced to the crowd that there’s going to be a guitar play now. I unzipped my guitar bag and was waiting for him to come to me. The teacher said, “There’s gong to be a guitar concert by Aditya and Deeksha!“. I was like, “Aditya and… Who?”. Teacher said, “Deeksha dear..”. Yet again, he proved to be a non deserving friend! I decided I’ll never consider him my friend again in my life! I carried my guitar and had practiced for it, I was the one who repaired his guitar! How could he even think of doing this to me! I was fuming with rage. I sat there with a heavy heart and an unwilling expression on the face. The duo began their show. Suddenly, I became the spotlight of the show. Everyone turned their heads towards me. Aditya told, “Hey Pratham, you’ve been my best friend from grade 1 to grade 10.. this is our last year in school. This concert us a tribute to you!” Aditya started playing the guitar and Deeksha sung a “Friendship song”. The lyrics told the story of me and Aditya! She sung all the lines that talked about our deep friendship! I was Wonderstruck! It was such a big pleasant surprise! I never even saw this coming!! He spoke with her all.those times planning a surprise for me! He shifted his room for practicing the songs for me! It was such a huge pleasant surprise! Tears rolled up in my eyes as she sung our story! I was touched. I hugged him after the concert and felt sorry for judging him! I felt stupid for not waiting with patience and jumping to conclusions! I tagged him as a worst best friend while all he tried to do was plan a huge pleasant surprise for me!! That’s when I realized how bad it is to jump to conclusions too soon! From then on, I never reacted so much! I learnt to be patient and learnt that it’s stupid to jump to conclusions without thinking! !